Scott McMicken stands, second from the left. Photo courtesy of Music Tastes Good. Music Tastes Good is slated to kick off a weekend of grooves, food and art in the middle of downtown Long Beach this weekend—starting tomorrow. All the build-up and years of planning have come down to this very moment, bringing bands on a spectrum of rock to Long Beach, like the Pennsylvania-born Dr. Dog. Dr. Dog is scheduled to light up the “LB Blvd. Stage” this coming Saturday from 8:35 to 9:45PM, just after Coachella fave Warpaint and just before the UK-born ska revival band The Specials. 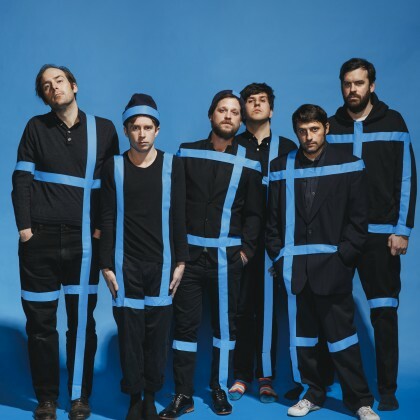 Dr. Dog has played a variety of venues, and is known to varying degrees throughout the country, also appearing on the Late Show with David Letterman, Late Night with Jimmy Fallon, Late Night with Conan O’Brien and The Late Late Show with Craig Ferguson. They’ve toured with The Cave Singers and label-mates Golden Boots. The Post caught up with one of Dr. Dog’s cofounders, Scott McMicken, who’s currently based out of Tuscon, a week or so ago, discussing the specifics of a Long Beach festival of this magnitude, and what keeps them ticking, year after year. Long Beach Post: Can you describe Dr. Dog’s relationship with Long Beach? Scott McMicken: Long Beach is very near and dear to our hearts. For starters, our tour manager and sound guy is an integral member of our family. His name is Sean Wisner and he grew up in Long Beach and still lives there. He’s a very proud man and a very proud citizen of Long Beach. He’s covered in Long Beach tattoos, he’s all about it—almost a zealot. And we’ve absorbed the passion for Long Beach vicariously through him. He’s the captain of our ship. We’ve spent many days off in Long Beach. I know a lot of guys—Josh Fischel, a Long Beach resident [the curator of Music Tastes Good] knows Sean Wisner from the early days of Sublime. And weirdly fell in with us. We also know his brother, Zach Fischel, who is a part of our label. It’s all kind of an incestuous thing [centered] here in Long Beach. How did the festival snag you guys? Fischel is curating, and he mentioned it [MTG] was in the works a few years ago. It’s our home away from home and we’ve developed an affinity for the city. For that reason, we’re super psyched to play in Long Beach. It’s a special event for us. Have you ever played in Long Beach? We’ve never played a show in Long Beach. We’ve played a lot of shows in Los Angeles and Orange County, but not Long Beach. The significance isn’t lost on us. How did Dr. Dog take shape, in your early years? We’ve been playing together for about 20 years, with two of us [McMicken and Toby Leaman] as songwriters. We both sing and we both write. We met in 1994/1993. The first day we met we played music together… and we never stopped. We decided we needed more people to flesh out the idea of a band—a drummer and a guitarist. We’ve had a couple of members come and go since we started touring in 2004. We haven’t really stopped touring since then, and began to slowly rise through the ranks… We’re not ubiquitously known. We’re known more in some areas than in others… it’s directly connected with how much work we’ve done in a specific area, touring. Tell me about Dr. Dog’s sound. How did Philadelphia, where you guys first started, influence the overall sound of the band? I don’t know, our sound is pretty varied. We’ve always let the band be pretty open-ended. We have a collage of influences. Philadelphia is pretty diverse… there’s not really one sound or scene that dominates. You can definitely say there’s lots of hip hop. Our influences include a lot of jazz, folky, country sounds. Philadelphia’s right on the Mason Dixon Line… as a music culture, Philadelphia is a varied thing. We’re kind of in a self-imposed bubble of our own making. Our sound is more unconscious/alienating ourselves from culture. We sound like an older band. How has the band evolved over time? We’ve been really lucky. We were just going through the expected pathway of white middle class dudes, graduated from college and just started washing dishes and continuing to make music. We weren’t operating in a career sense way.. We weren’t promoting ourselves. We were really lucky. Nothing happened overnight. We began enjoying a lifestyle that was part of a musical network. It’s the same spirit then as it is now. Now there are greater rewards but greater risks. What does your set list look like for the night? Basically we’ve been playing all summer with a broad set list. We have over 100 songs to choose from. A new record just came out this year, so that will be a bit of our emphasis. But it’s a mixed bag, with old and new songs. There are always changes. The tunes always tend to be something different live than on the album. It’s my favorite to play live. What’s on the agenda for your trip to Long Beach? With every trip to Long Beach, we are basically Sean Wisner’s shadow [laughing]. I’m sure we’ll go to Joe Jost’s. But we’ll mostly be with Wisner, the unofficial king of Long Beach. Music Tastes Good is a three-day festival set to take place in Long Beach Friday, September 23 through Saturday, September 25, in addition to an exclusive food experience. Ticket prices vary. To purchase tickets and view the complete schedule, click here. The Main Entrance to the festival will be located at East 3rd Street and Elm Avenue.